Fastline sought a way to offer its customers an online ad creation tool that did not require any special knowledge of QuarkXPress or InDesign. Fastline Publishing, the pre-eminent content publisher for the agricultural and trucking industries in North America, sought a way to improve its customers' experience of placing advertisements in ad book publications. The company implemented a highly successful web-search program called FastSearch, but the same data (images and product information) was not usable for print ads. Fastline retained DPCI to implement an Online Publishing System in order to offer Fastline customers a way to create high-quality print advertisements right through a Web browser. Further, the experience could all be done without any special knowledge of QuarkXPress or InDesign. 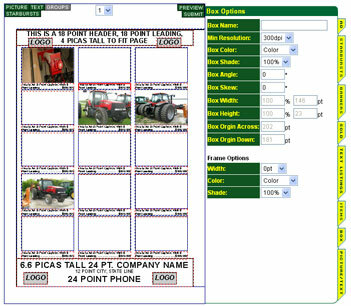 With the new online ad creation tool, farmers and trucking companies are now able to quickly create high-quality advertisements with the inventory that is on hand very close to print deadline dates. With this new service, Fastline customers have a higher rate of return on their ads, more immediate visual on how ads will look, and an overall more pleasant experience working with Fastline.